Samsung just brought the Galaxy S III to the market and it immediately had to face an Apple iPhone 4S in a drop test. AndroidAuthority decided to redo the drop test from last year, when the Galaxy S II met the iPhone 4S on the sidewalk curb, and survived thanks to its Gorilla Glass screen. Now, the Galaxy S III comes with Gorilla Glass 2, so it’s interesting to see how it’ll fare in the same challenge. Mind you, the drop test doesn’t come even close to being scientific – the phones hit the ground at different angles which has a pretty huge effect on the result. Nevertheless, the video is fun to watch if you don’t get chills watching expensive gadgetry getting tortured. The test, however sloppy, was still interesting to see. Any thoughts you might have on it are welcome in the comments section below. 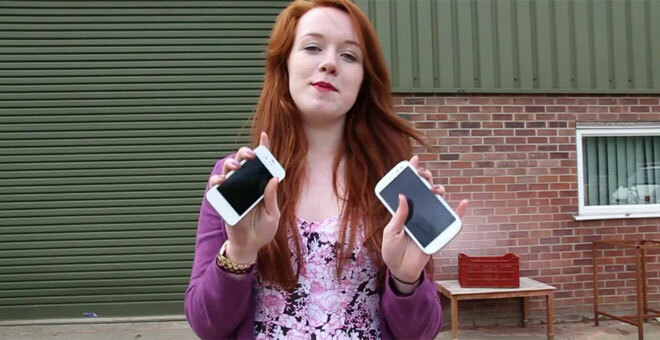 Update: Square Trade also uploaded their Galaxy S III and iPhone 4S drop test video. It looks like they cheated a little bit and tested an iPhone 4 instead of an iPhone 4S. Nevertheless, if you want to see even more tests where the ultra-expensive smartphones get abused, the video is below.